Mountain Cabin NC "Rocky Falls Retreat"
Description: Huge rock pillars hold you on the side of the mountain. Be lulled to sleep by the sound of the cool water stream cascading over waterfalls. Awaken to the sight of a glorious sunrise over the mountains beyond and below. Several decks available pick to suit your mood. Never had a tree house as a child? 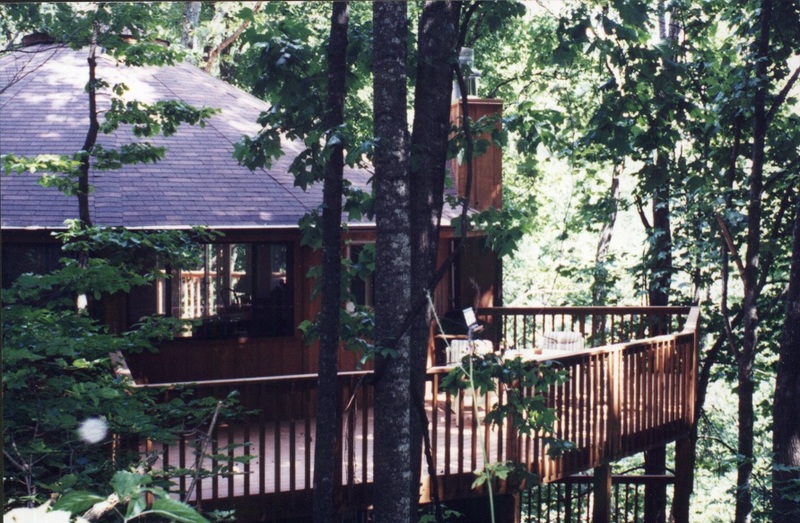 We have the perfect deck for you. The retreat is on a 14.3 acre property so you will not see your next door neighbor. We also have a trail next to the house which leads to several waterfalls. Over one of these falls there is an additional deck with a table and chairs to enjoy lunch. Not only does this deck overlook the falls, but it affords a spectacular view of a wall of rock and rhododendron. The locals call the house the "Round House" which is actually a 15-sided house supported by the 15 massive rock pillars. The following pictures will show you that we have furnished the house with American made Lexington and Bob Timberlake pieces as well as made in the USA accessories wherever possible. We have a diverse selection of books and games for you to use as well as a satellite TV with VHS and DVD players. There is also a CD/radio player. The kitchen has most of the general things needed. Additional dishes are located in the antique pine cupboard. Adjacent to the kitchen area on the large deck outside is a gas grill and a large table with six chairs. The gas cylinders are provided. The master bedroom has a connected private bath with a Jacuzzi tub. The other bath is accessible from the main hall. There are two bedrooms and one sleeper sofa. Linens and towels are located in the closet across from the washer dryer. The house will accommodate 4 to 6 people. We must tell you about the locals. Turkeys love to hang out near Rocky Falls. On sunny days they usually appear in twos, but on a misty morning whole flocks can be heard hiding undercover. Our Pileated woodpecker is often heard, sometimes seen. This is the one that looks like Woody Woodpecker and was recently seen on the tree next to the house. We have lots of warblers, always fun to watch, some of them disappear and reappear like magicians. A little Carolina wren trusted us enough to leave her eggs and babies in the house on the deck this spring. Watching mom and dad feed their brood was lovely entertainment. Deer are around, but not as abundant here as in grassier locations. We have built a little bear fortress for our recycles and trash. Bear have been sighted nearby, so we are very careful not to leave anything out that might attract them. Our raccoon friend is sneaky. He usually steal only one sneaker if you leave sneakers on the porch. The sneaker can usually be found in the stream near the house. Local interest: Writers, potters, glass makers, all manner of craftspeople who often open their galleries to the public. Gem mining, fishing, golfing, hiking, tubing, and rafting are also available.